তখন এই সুযোগটা ছিল না। এখন যখন সুযোগটা এসেছে তখন এটাকে হাত ছাড়া করা ঠিক হবে না বলেই আমরা জেনারেল এরশাদকে কথা দিয়ে এসেছি। One has to be pragmatic in politics. Tell us now, what could be so impotant a matter to be discussed for which you had to fly from Dhaka to London? The situation is very grave Dalim Bhai. The decisons that power hungry Zia is taking obe after another that is not only weakning the freedom fighters organizationally but their very existance has become untenable! Not only that the way he is formulating his policies obliging India, very soon Bangladesh would turn into a client state and the nation would become slaves of India. The true patriots and the nationalists members of the armed forces and the freedom fighters are unable to accept that. All of them have one thing to say, either he has to be brought back from this course or else he should be removed from the power with out any further delay. Understood all that you have said. Your apprehension is not irrational, but the point is who is going to bell the cat? Gen. Manjur is contemplating to take such an initiative basing on the support of the surviving freedom fighters. I had to take this trip to discuss this matter with you and to know your views. Before giving our views whether any such initiative would be successful or not, I would like to say a few words relevent to the subject. Listen dear brother, from the time of liberation war with a clear aim we took the initiative to organize ourselves to fight against the farfetched Blue Print of India regarding an independent Bangladesh. You are aware of that. Those who all believed in the same ideals, ideology and long standing working plan were proceeding under the cover of the war. Dedicated patriotic commanders like Zia, Taher and Jalil joinded hands. At that juncture we had to keep an officer like Zia in the forefront for carring forward our organizational activities considering the objective reality on ground. This is why we had to accept Zia as our central figure. From his side there was a condition that till he could be installed at seat of power we have to maintain secrecy about his association with our organization. For the interest of the organization his condition was accepted. But after 15th August and 7th November’s revolutionary uprisings when he was made to sit at the centre of power, he decided to move in his own way. Why he had taken that decision is his personal decision. But due to his such decision all our cherished dream and aspirations dashed to the ground. We lost! The consequences are now clear to every one. Our struggle was the expansionist India under Soviet axis, he had severed the roots of that struggle and after compromising with them now he has become the champion of pro-people nationalist politics. His 19 point programe is also taken from working agenda. The manifesto of his party has also been drafted like that of our political manifesto. Even after all these I must say no matter whatever might be his stature as a revolutionary and his manifesto to be copied one where is his fleet of caders to implement that? He has cold bloodedly murdered more than 3000 tested patriotic members of the armed forces creating various excuses just to weaken the Sena Parishad and to up root those who had brought him to the centre of power. All members of the armed forces have become rotten eggs therefore, it would not be possible to take any revolutionary step with them. If they did not leave the army then would Zia be in a position to do what he is doing now? He could not. Any way, all these are hurdles on the way of revolution. Now, I shall say a few words about Gen. Manjur. Whatever I am going to reveal is hardly known to any one other than Gen. Manjur, Col. Mahbub and a few others. Gen. Manzur is a brilliant army officer. After finishing his studies at the Sargodah Public School he joined Pakistan Army. Gen. Manzoor belongs to a middle class family. Because of his vast knowledge about armed forces, war strategy, war history, his intelligence and efficiency during the Pakistan days he used to be called by many as ‘Gudarian’. He has the ability to become a General in the professional army of any country. 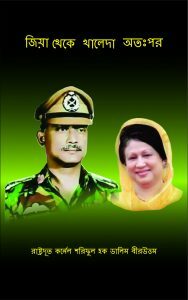 That is why today he is a General in Bangladesh Army as well. But I am not sure whether he has the right kind of mind set, is he capable and prepared to de-class himself to the level of commoners to become a popular revolutionary leader. There are reasons why I am saying this. Almost at the fag end of the liberation war wheb he escapred from Pakistan and joined the HQ, he was posted as the sector commander of No 8 sector. No 8 sector was one of the sectors where I was assigned to work as guerilla advisor. In that capacity quite a few times I tried to discuss with him about the Indian blue print and our activities but he avoided me every time. After the independence when Indian forces were looting and taking away everything from the country we decided to resist there loot and plunder. At that time at the order of Tajuddin’s government it was Gen.Manzur being an obedient professional officer who entrapped Maj. Jalil asking him to join a conference at Jessore and got him arrested. We were all enraged at this outrageous act and forced the Awami government to release him and to reinstead back in the army, he carefully kept himself aloof in that process. After the independence I had tried to talk to him through Col. Mahbub but failed. Then again after the revolutionary change of 15th August I got him recalled from Dehli Mission and requested him and work together for the interest of the revolution. But, his reply was some what, ‘Ready to catch fish but with out dipping into water’ and went back. Even after this yet there remains something more to be said brother. After 7th November, when Gen. zia started indiscriminate killing spree in all the cantonments to consolidate his power a timid person like Shishu Bhai also has protested. But Manzoor had supported that genocide to attract Zia’s attention. When our hands and feets were being savared to deplete the strength of Sena Parishad even at that time most of the senior officers at the corridor of power along with Manzoor had supported Zia’s plan to prove their loyality. We are now lame, incapacited, powerless therefore, no matter how nobole might be gen. Manzur’s intentions are, in no way we can co-operate or help him. Besides, we are not aware what kind of revolutionary Gen. Gudarian is and what is his revolutionary agenda. At that time it was not enough to oust Gen. Zia alone but the whole lot of senior officers should have been thrown out from the armed forces. In that case, your goodself also would not have been left out from that long list. Most of the senior lots are oppurtunist power mongers. They know only politics of power but not the politics of the people. After 15th August we prepared a list of only 36 corrupt and characterless army officers to be dismissed but Gen. Zia was doing dilly dully to execute that. This was one of the reason of the reactionary coup det’at of 3ed November. It might have been very easy route them all along with Zia but if the Indian government taking the advantage of 25 years treaty ordered their armed forces to march in then could it be possible for us to counter that aggression, Sir? At that time many out of that lot might have joined with the invading forces chanting the slogan ‘Joy Bangla’! With that opportunity many of the repatriated officers and soldiers could turn into patriotic freedom fighters and we would have become Razakars. We have lost enormously. Accepted every as fate accomplee! But did not like to be stamped as national traitors. After this Gen. Manzur did not prolong any further. Tell me why suddemly Gen. Gudarian himself took such interest to meet me secretly? Alright, let me tell then. Gen. Manzur’s carrier is coming to the end. According to our information Gen. Zia already had decided to dump Gen. Manzur at the Staff college withdrawing him from the command of the Chittagong Garrision for a while then dinning him out cerimoniously with the army band. If this information could reach us then there is no reason why Gen. Manzur should not be aware of this. Gen. Gudarian is finding hard to soallow this bitter pill. But this is of no concern to us. But the suttle game which is being played by Gen. Ershad behind the scene and its disastrous consequences are matter of grave concern to us. Gen. Zia seems to be unaware about his game plan. I am not sure if at all Gen. Gudarian and his followers I mean, you all are aware or cared to ponder about Gen. Ershad’s sinister planning behind the scene! Please, dwell more openly on this issue Dalim Bhai. Have you all noticed that at the command level all chosen freedom fighter officers are being posted at Manzur’s Dividion through Brig. Nasim(MS), the snake! This not to strengthening Gen. Guderian although, apparently it appears to be like that. Rather I should say, Ershad through thid srewd move is trying to plan to kill all the serviving freedom fighter officers with one stone as signaled by the Indian government and RAW. Alongwith them a few ex-JRB(Jattyo Rakkhi Bahini) officers are also being infiltrated as his eyes and ears to provoke Gen. Manzoor. Capt. Mozaffar and Lt. Khaled are tow of those agent provocatiers. The end result of this heinous move would be in the tussel between Zia and Manzoor Zia would not be there at the centre of power on the other hand availling the oppurtunity gauzing Zia’s popularity Ershad will take out all the freedom fighter officers from the net and get them killed to clear his way using the shoulders of the BNP’s nominated President. This he must do. Otherwise, it would not be possible for him to remain in power as a repatriate officer after usurping state power. To take forwad the Indian Blue Print expeditiously the ring leader Ershad would be saddled in the seat of power by India and RAW with the blessing of AWAMI-BAKSHALITES, so called the Lefts including JSD and some traders in religion belonging to a few Peer ancestries. Guderian General might not give any value or credence to our presumption. Even than you may convey to him all that has been said if you like. Befor I finish I would like to draw a conclusion for your convenience. To day’s Zia is not only the product of 15th August and 7th November’s revolutionary armed uprisings, now his potistion is well entrenched in all respect. Eliminating those revolutionaries who had brought him to the centre of power Zia very cunningly established that he had no relation with the revolutionary activities. At the same time he has managed to gain confidence of most of the powerful countries including India in particular portraying himself as a centrist and believer in the politics of compromise. With propagating the saga of broken suitcase, torn vest and creating a gimmick with his cannal digging program having a spade on his shoulder Zia has been able to form a positive image for himself within the people. To day his self identy has also emerged in the world. Gen. Manzur has lost the time to take any initiative against Gen. Zia. Manzur might be powerful at Chittagong but Chittagong is not whole of Bangladesh. Other tan Chittagong, he has no significant control over other cantonments. From the begining Gen. Mazur had been well respected by the officer class but he never took any initiative to cultivate closer relation with the ordinary soldiers and the freedom fighters. Before the garb of sheep is unfolded from the fox if anything is made to happen that might be a boomerang for Manzur. Right at this moment it is not possible to remove Zia from his way, I have said this in view of our long time experience. To bring back the country on the right track he has to be removed from power but it appears that General Gudarian has that streanth. Because, at Dhaka, Ghatail, Joydev Pur and Savar Gen. Ershad’s loyalists have been posted to command all the unites. Ershad’s confidants are also posted as DGFI and DG NSI. I am not sure, how much Gen. Zia is aware of these matters. Gen. Ershad very carefully playing the double game with Gen. Nuruddin, Gen. Shawkat and Brig. Nasim taking them all into confidence. Manzur’s identity world wide is very negligible compared to Zia. No matter how big a revolutionary General Gudarian might have become now, without people’s support, an organization based on correct ideology and a fleet of tested caders he would not be possible for him to make any revolution successful. Accoring to this definition of a revolution did Gen. Manzur ever taken any initiative? The answer is very clear, no. After coming to power it is not possible to create such a party and workers, President Gen. Zia himself is a glaring example of that. Last words, untill and unless Dhaka can be brought fully under control any attempt to over through Zia from power would be suicidal. For the last time I would like to know can’t you all provide help and co-oparate in any way with Gen. Manzur in his endevor? You are an old comrade that’s why we had a detailed discussion, if it was anyone else we wouldn’t have done so. If our analysis becomes helpful to General Guderian that would be our contribution. Look my dear, we are revolutionaries. Individuals are not that important to us. To us, our dream, ideology, principles, country and national interests are supreme. For the greater interest of the country and the nation we can accept everything. Our struggle is not just for power. Do tell Gen. Manzur, although his days are numbered but that must not lead him to take any such desperate move which would turn out to be an infantile disorder and disastrous. It is true, at present we have been defeated due to Zia’s betrayal, but the time changes and along with that new oppurtunities are also created. This is the bottom line. Although his days are numbered but that must not lead him to take any such desperate move which would turn out to be an infantile disorder and disastrous. This is the bottom line. Really Dalim Bhai, I am not only baffled but also surprised, having long exiled life abroad how could it be possible for you make such meaningful indepth analysis about the on going situation back at home, my hats off to you all! The answer is very simple. Since the time of liberation war we had been thinking about the future of the nation. As long as we live at the will and mercy of Allah, this meditation would be the inspiring factor for all of us to live. Like in the past in future also we shall avail every oppurtunity to serve the interest of the country and the nation remaining above all worldly expectations and what we get in return. After a long time we held such a long meeting. If you have nothing more to ask then let us call it a day. No, I have nothing more to ask. Ofcourse, whenever you like. Please convey our Salaam and Dua to all the rest and do remember us in your prayers. Shall do, In Sha Allah.